Explore Cologne in an active and exciting way. A bicycle tour through the cathedral city is an experience in any case. Whether on our English-speaking guided city tour, daily at 13:30 or with an individually arranged tour - with friends, your family, school classes or your company you will discover the historical highlights and enjoy many impressions of Cologne. Simply select the desired date and book your ticket. The cycling tour through Cologne takes place with two or more participants. Learn all you need to know about the origins of the cathedral city on the 15km safe route. Experience the most interesting places in Cologne and the architectural diversity of the city: from Roman times to modern times. Enjoy a great view of the city's skyline. Relax and unwind during our breaks and learn Cologne anecdotes from our guides. When? From 01 April to 31 October, daily at 13:30. Registration/booking is possible until 10:30 a.m. on the same day. Please understand that the Cologne Tour only takes place with a minimum of two participants. Where? The meeting point is our rental shop on the banks of the Rhine "Radstation am Rheinufer", Markmannsgasse/Deutzer Brücke, 50667 Cologne. The location is only a few minutes walk from our bike station at the main station. Below you will find a Google map for directions. The bike tour takes about three hours. If you wish a different duration of the tour, the time frame can be individually adapted to your wishes by prior arrangement. Of course we also offer vouchers for our tours! The voucher costs only 45,00€ (for two persons). You can choose the desired date yourself with the voucher at any time. Simply order online now and receive the voucher immediately by e-mail. + Cologne actively with the bicycle explore. + Experience real Cologne insider tips, also an ideal gift for Cologne residents and all those living in the surrounding area. + The voucher will be sent directly by e-mail! + Simply pay by credit card, direct debit, bank transfer, Paypal, etc. 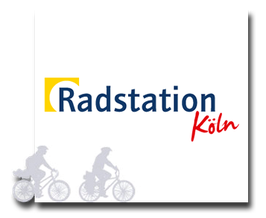 + With the purchase of a voucher you support the social project Radstation Köln.